Sensei Michael Smith has over 50 years’ experience in aikido and a wealth of weapons knowledge handed down from Shihan’s Chiba and Smith. Sensei Michael Smith has worked his way up through the ranks from Head Fukushidoin, to the position of Shidoin while he was a member of the United Kingdom Aikikai. A senior member for many years, he sat on the Technical committee and was also a trustee for Ren Shin Kan until the dojo moved from its Old Hill home. His wealth of knowledge (handed down from Shihan William Smith) has proved to be invaluable to all students who have had his instruction whether they be regardless of organisation loyalties. Throughout his Aikido career Mike Smith has maintained ties with many of the UK’s senior instructors who head their own organisations. On being promoted to 3rd Kyu on his second grading by Chiba Sensei in early 1969, (this is when he joined the Aikikai of Great Britain) he embarked on almost eight years of dynamic concentrated training in Bokken, Jo, Bo, Iaido and of course the body art itself. These years with Chiba Sensei, and under the strict instruction of Mr Smith gave him and many others a good realisation of Aikido, making the foundations of what is practised and taught today. Already being 1st Kyu he was given permission to wear Hakama in 1973 and then promoted to Shodan in 1974. His progression took him to 6th Dan in January 2010, by the way of 2nd Dan in 1989, 3rd Dan in 1993, 4th Dan in 1996, and 5th Dan in 2002 gaining his coaching qualifications on the way, being awarded Fukushidoin in 1989, Senior Coach in 1994 and Coach Tutor for the British Aikido Board in 1995. In January 2000 he was promoted to Shidoin. Michael Smith is a Senior Instructor and also the association principal at the Go Shin Kai. Headquarters Dojo (Ren Sei Kan) at Kidderminster. He trained under Chiba Sensei at Leicester. His progression took him to Fukushidoin status in 1986 and Coach recognition in December in 1992 and Senior Coach 18th November 2001. He gained Shodan August 27th 1977 by Chiba Sensei, Nidan July 30th 1985 by M.Fujita Sensei – M.Kanetsuka Sensei, Sandan July 18th 1989 – Chiba Sensei and Yondan August 19th 1996 – W.J.Smith Sensei – G.Jones Sensei and Rokudan/Shidoin March 24th 2002, and promotion to 6th Dan Shidoin 2014. Roger is a Senior Instructor at the Go Shin Kai. Headquarters Dojo (Ren Sei Kan) at Kidderminster. He soon attended courses held by K Chiba Sensei and gained Shodan in 1979, Nidan in 1988, Sandan in 1989 by Senseis K Chiba and W J Smith. Awarded Fukushidoin in 1992, Yondan in 1996, Senior Coach in 2001, Godan in 2002 and Shidoin status by Senseis W J Smith and G Jones. Promoted to Rokudan in 2014 by Sensei G Jones. Paul is a Senior Instructor at the Go Shin Kai. Headquarters Dojo (Ren Sei Kan) at Kidderminster. In 2004 he reached the rank of Ni-dan (2nd Dan Black Belt) and accepted the title of Fukushidoin (Assistant National Coach) awarded yet again by Shihan Smith. In the same year he went to Japan, spending 3 weeks in Tokyo where he took instruction from Doshu, Shihan's Seijuro Masuda, Tsuruzo Miyamoto, Yukimitsu Kobayashi and Shigeru Sugawara. In January 2010 Sensei Palmer obtained the rank of San-dan (3rd Dan Black Belt), and dedicated his efforts to his ill father who passed away a month later. 2015 marked the 30th anniversary of the UKA and a special visit from Waka Sensei (Dojo-Cho). During this summer school, Sensei Palmer was promoted to the rank of Yon-dan (4th Dan Black Belt) and he continues to improve his Aikido through diligent training and instruction at his club in Birmingham (Zanshin-Kai) and at Kidderminster. He is authorised to grade up to 1st Kyu (Brown Belt). Patrick is an Instructor at the Go Shin Kai. Headquarters Dojo (Ren Sei Kan) at Kidderminster. James is an Instructor at the Go Shin Kai. Headquarters Dojo (Ren Sei Kan) at Kidderminster. Chris is an Instructor at the Go Shin Kai. Headquarters Dojo (Ren Sei Kan) at Kidderminster. I have been practising, teaching and promoting Aikido and ‘martial way’ training for many years. I took up Aikido in 1977, while a postgraduate student, at the University College London (UCL) Aikido Club, becoming principal instructor there c.1986-2015. I currently run the Cheltenham & Bloomsbury Aikido Club and organise the UCL Alumni Aikido & Friends Group. I have trained students up to 4th Dan and up to Fukushidoin teaching rank. As one of GSK’s founding members, I work with GSK’s Principal and Committee to further its development and its good relations in the wider Aikido community. The Cheltenham & Bloomsbury Aikido Club, which I formed in 2018, offers weekday daytime training to those adults who for work or family reasons may not be able to train in the evenings. The UCL Alumni Aikido Group & Friends is an alumni, global, network which embraces all Aikido affiliations. I set up the group in 2013 in recognition of the significant role that UCL alumni and staff Aikido practitioners have always played in providing continuity, experience and teaching at UCL Aikido. The Group has social and working aims: to keep in touch with past UCL Aikido students all over the world; and to provide a platform of support for the student-run UCL Aikido Club. As a part of this support, I act as the UCL Aikido Club’s GSK Shidoin, mentoring the club’s next generation of instructors and I maintain the Bloomsbury Aikido Club (London) which, post 2017, is an alumni counterpart to the student UCL club for the organisation of special courses in London. My early teachers at UCL were students Barry Hutchinson, Peter Goldsbury and Marian Hutchinson (then Holland). Between 1983 and 1994, I studied with Sensei M. Kanetsuka; from 1994 with Mr William Smith MBE (d.2006); now with Mr Mike Smith at Ren Sei Kan Dojo, Kidderminster. I gained my 1st Dan in 1986 and 5th Dan in 2012 and for me, Aikido training is lifelong learning. From 1978 I was a student officer at the UCL club, as a 5th kyu grade I started taking responsibility for leading occasional practices, then teaching, eventually becoming its principal instructor. In the early years, I was also training at M. Kanetsuka’s Ryushinkan Dojo. 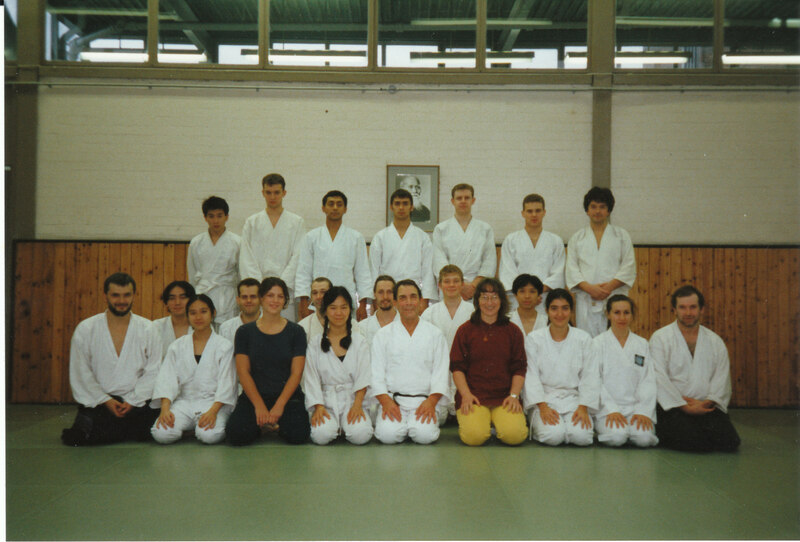 In 1985, having successfully negotiated with UCL Students’ Union for Ryushinkan to hire the dojo, I was given the responsibility of being a club officer and, later, instructor for Ryushinkan (UCL site). The two clubs were closely associated until 1994. With the experience of having been a student officer and then taking up a job developing the gym for the UCL Students’ Union (in which I stayed until 2010), I was able to mentor successive generations of UCL Aikido Club student officers and keep the club going academic year after year, assisted by instructors whom I had trained. I have been involved in two status changes of the club at UCL, both of which were effected to preserve the continuity of Aikido at UCL. In 2004, UCL Aikido transferred from a student union society to being a part of the volunteer ‘Martial Arts Activity Programme’ that I introduced at the student union gym, Bloomsbury Fitness (BF). This status continued until 2015, with the club’s name becoming ‘UCL Aikido Club at BF’, then from 2013 ‘Bloomsbury Aikido Club at BF’. During 2013-15, the club had problems with a restructured gym management (which was gone by mid-2017). It demolished the traditional dojo then attempted to close down Aikido. I worked with the UCL Aikido students to revive the student union society, the UCL Aikido Club. In its early stages this survived as an alliance of three Aikido styles, each having its own UCL student representatives. Alumni Group networking helped to bring this about. I continued to run my Bloomsbury Aikido Club externally, now as an UCL alumni counterpart to the student UCL Aikido Club. In January 2017 I handed over the teaching of the UCL Aikido Club to talented younger instructors from our Bloomsbury, UCL and Alumni groups, headed by Andy Washbrook, 2nd Dan and Ara Schorscher-Petcu, 2nd Dan. "It was quite different from other martial arts I had practiced and I was hooked on my first lesson!" He was subsequently awarded Sandan in 1992 by the late Sensei Tamura Nobuyoshi 8th Dan. "I would say that my Aikido studies, not only complimented my professional development but also supported my personal growth and what I'm about as an individual"
Ironically, work commitments prevented Tim from practicing for a number of years but upon retirement and a move to Shropshire, he resumed training with Sensei Paul Evans 5th Dan, under the leadership of Brian Burrows 7th Dan Shihan at Shun Poo Kan Aikido. "I was a little apprehensive at going back onto the mat after so many years but I was warmly welcomed by Paul, Brian and their students - something I have found is the norm wherever I have practised in the world"
He achieved Yondan in 2016. Through Shun Poo Kan, Tim was introduced to Sensei Mike Smith (6th dan ) Principal at Goshinkai Aikido, Kidderminster and now practices regularly at both SPK and Goshinkai. "The continual improvement process of physical and mental refinement, the obvious health benefits and enjoyment of training and constant learning with a diverse group of people, is what drives me now"
Andy is a junior Instructor at the Go Shin Kai. Headquarters Dojo (Ren Sei Kan) at Kidderminster. Andy started practicing Aikido in 1994 aged just 4 years old, training at the old Park Lane dojo in Cradley. Andy continued his training at the Old Hill dojo as the organisation grew. His commitment to Aikido was recognised early on by Sensei William Smith who was keen to move Andy in to a senior class. At the age of 10, Andy began his long training relationship with Sensei Mike Smith, under whom he still trains to this day. Andy quickly moved through the grades, earning his 1st Kyu aged 13. Andy obtained his Shodan in March 2014 and completed his Nidan in September 2017. Greg is a junior Instructor at the Go Shin Kai. Headquarters Dojo (Ren Sei Kan) at Kidderminster. Entered University College, London in 1992 to study Astrophysics and began training in both aikido and karate at the Bloomsbury dojo, becoming a regular UCL Aikido Club with Barbara Sotowicz and Mire Zloh. Particularly memorable were the seminars with Mr William Smith MBE (photo). Relocated to Northern California in 2000 with the tech boom and trained in the San Francisco Bay Area. Met my wife on the mat while preparing for my shodan test with Frank Doran Sensei at Aikido West. Following the bursting of the dot-com bubble, moved to the heart of the American Midwest and helped lead one of Mitsugi Saotome Sensei’s dojos in St Louis for nine years, where I began teaching on a regular basis. We were heavily influenced by our mentor Marsha Turner Sensei, now leading Chicago Aikikai. In 2005 we co-hosted a very popular public friendship seminar with a local student of Haruo Matsuoka Sensei in Southern California. We were privileged later to join his students in their annual tour to Japan to visit his master Seiseki Abe Sensei (1915-2011) in Osaka. Around this time we were very fortunate to find senior leadership for St. Louis Aikikai in the form of Michael Grossman (who trained at Hombu Dojo for over a decade) and John Ekey (a student of Hiroshi Ikeda Sensei in Boulder, Colorado for eleven years). In 2008 we hosted our first seminar with Ikeda Sensei, where I took my nidan (2nd dan) test. Tom started training Aikido in 2001 at St Andrews University Dojo in Scotland, though strangely under the auspices of Aikikai Belgium. He continued for two years in Kochi City, Japan, under Sawamoto Shihan. Since then, he has trained around the UK, including Exeter, Cambridge, UCL Dojo and Walsall, in both Aikikai and Iwama dojos, and returns annually to Japan. He is a priest in the Church of England and currently serves as Chaplain to Lichfield Cathedral School, where he established Seisankan Dojo for the children in January 2018. Other interests include playing the shakuhachi, speaking Japanese and writing horror sci-fi fiction under the pen-name of Thomas Idoine. or Ōsensei (大先生/翁先生), "Great Teacher".